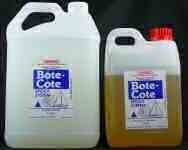 Reviews: Bote-Cote 6 Litre Epoxy Kit : Boatcraft Pacific, the home of wooden boat building. I am extremely pleased that I obtained a cure, free of amine blush, despite some low overnight temperatures, 3C. This is in marked contrast to my previous experiences with West System. Perhaps you could approach ....... in ....... with a view to stocking your epoxy. Your formulation is clearly superior in outdoor, non temperature-controlled applications.